Can you please offer help for the PRTG setup wizard Essential Settings screen? What are the administrator account credentials for? Which web server IP and port should I choose for PRTG? 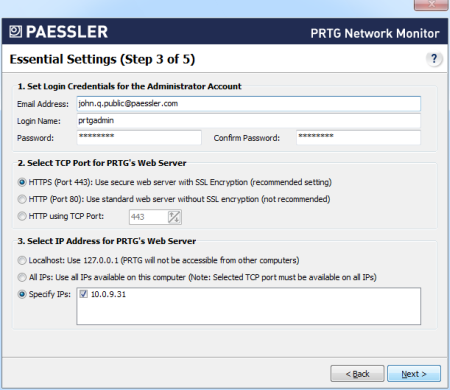 In order for the user to view monitoring data and make settings, PRTG provides a Web server. You can log in to the PRTG Web server using either one of the Web interfaces or the Windows GUI interface. Please specify settings for the Web server below. Enter a name for the PRTG administrator login; this is your default login. If you do not change this setting, the default login name prtgadmin is used. Enter a password for the PRTG administrator login; this is your default login. If you do not change this setting, the default password prtgadmin is used. Re-enter the password for the PRTG administrator login. PRTG is running a Web server in order to provide the Web- and Windows interface. Please specify on which port this Web server will run. SSL-secured connections can be established on port 443 only. Note: Although the connection is secure, you will see a certificate warning in your browser when logging in to the PRTG Web interface, because the default certificate is unknown to your browser. You can install another SSL certificate for PRTG later. Note: If port 80 is free, PRTG will reserve it as well. When users try to connect on port 80 via HTTP, they will then be redirected to port 443 via HTTPS. You can change this behavior later. This option is intended for systems with an existing Web server. Enter the desired TCP port you want the PRTG Web server to run on. PRTG is running a Web server in order to provide the Web- and Windows interface. Please specify which IP address this Web server will run on. Later, you can log into PRTG by simply pointing your browser to the specified IP address. PRTG's Web- and Windows interface will only be accessible from the computer PRTG is installed on. Add a check mark in front of every IP address you want the PRTG Web server to be available on. Error message when trying to set up PRTG to use SSL on port 443. Running an IIS on the same server.